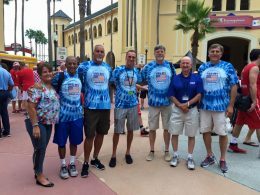 The FIMBA basketball brotherhood from across the globe recently gathered in Orlando, Florida’s ESPN Wide World of Sports Complex for FIMBA’s 13th bi-annual World Masters Basketball Championships. 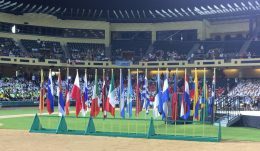 For them, it was an anticipated masters athletic competition comprised of 215 teams representing 36 countries. 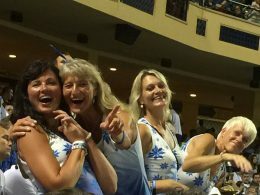 For me, finding happiness at the FIMBA World Masters Basketball Championship spoke of a better world. It’s no secret that I’ve never played sports. I recoil from negative competition and want to see everyone win. 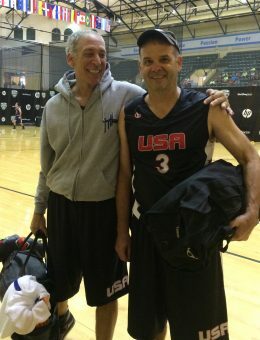 But joining my husband at the latest masters basketball love fest gave me a unique opportunity to see happiness literally “played out” on the courts of this global athletic event. I made several key observations that can be replicated. May they add to the happiness quotient in your sphere of life, too. These smiling faces from Columbia sporting sombreros and national flag were one of dozens of teams promoting their heritage during FIMBA’s opening night parade. They were joined by other creative teams who took joy in celebrating their unique cultural colors through costume, dance and even song. Countries like Russia, Ukraine, Greece and others have recently experienced trying times as represented by global news. But in an environment that fosters play around the game of basketball, only the finest feelings arise. 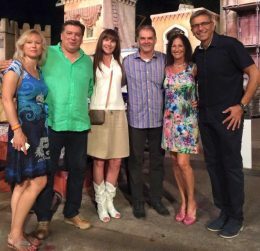 People from differing nations become familiar and fond when cultivated in a week-long setting nurtured over flavorful food and fun. We often equate growing older with growing insignificant. Here, FIMBA teams start at age 30 for women and 35 for men, including masters level players through the 75+ bracket. Pictured above are some 60+ USA team members sporting their generation’s familiar tie-dyed tee shirts with an American flag. Hardly senior citizens in the traditional sense, these players stay vibrant in business, culture, fitness and fun. This might be a convocation of masters basketball players but it welcomes all. The photo above depicts avid master Damon Ellison (center) who, due to health reasons, couldn’t play in these games. Because his spirit adds so much to the sport, he was chosen as flag bearer to introduce all teams from his home country. The FIMBA World Masters Basketball Championship tradition encourages the exchange of token gifts as a global, goodwill gesture. Everything from team jerseys to souvenir pins and cultural handiwork to chocolates make their way from one country to another. 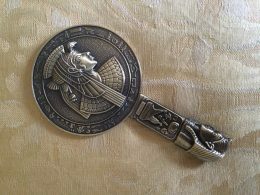 Pictured above is the bronze cosmetic mirror I received from Ossama El Dabbagh, a veteran FIMBA referee hailing from Egypt. As players contemplated their next game, my thoughts were fixed on the more ethereal and transcendent. I captured the above photo of my husband Jim Sweeney (pictured above) with his teammate Eric Fleat. The two squared off during the late 1970s when Jimmy played for Boston College and Eric hooped for Biscayne College. 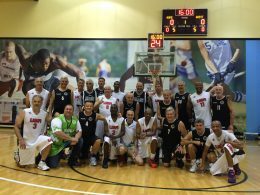 Basketball reunited them when we moved to Florida in the 1980s and here they appear in 2015, playing on the same USA 55+ squad. 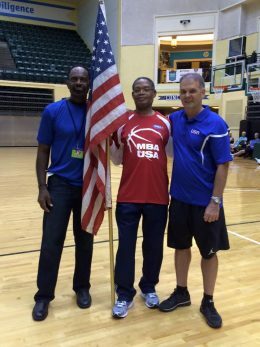 A reflective player remarked how FIMBA basketball brought life full circle for him, too. Decades ago, businessman Arnie Whitman played his beloved sport for Northeastern University, but life circumstances curtailed him from completing his varsity years. Competing again on the USA 60+ Gold FIMBA basketball team turned his previous loss into an unexpectedly joyful — if not ironic — lifetime gain. 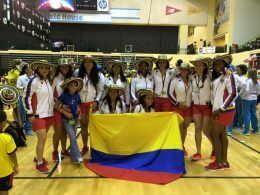 FIMBA’s world of masters basketball isn’t “just for men.” Women’s teams from Russia, Brazil, Slovenia, Argentina, Slovakia, Peru, Columbia, Costa Rica, El Salvador, Estonia (pictured above) and elsewhere compete and grow on this international circuit. A love of the sport, a passion for travel and the desire to face off against their finest international counterparts brings them back to FIMBA again and again. Their integration includes play with — and against — men on international exhibition matches, too. When the final buzzer goes off and the winning team is cast, there’s always a photo to memorialize the game. There remains a grateful spirit for the competitive fellow players who challenged the “losers” to their best. A curious air of appreciation pervades, maintaining the delicate balance between facing quality competition and regarding them as off-court friends they look forward to playing against again. This year, my husband’s USA 55 team lost by a single — crushing — point to Chile in the final moment of the semi-finals. The players are already planning their next face-off when FIMBA hosts the Pan American games in Costa Rica next April. The rematch will be welcomed with pleasure and gusto by their Chilean basketball buddies. You may find yourself today in any kind competitive arena: academics, industry, politics or — as in the case of FIMBA — sports. Wherever you are, may you find ways to transform your competitive world into a happy one, too! I am envious of all those who participated in this event! It looks as though everyone had a blast! Pathfinder, you would have LOVED being there! Maybe next time! Congratulations! Maureen on a article written with style and personal perfection. WOW! You are a awesome reporter, capturing highlights that make me feel I too was there experiencing my brother CJs opportunity of his lifetime. Thanks, Dorothy! It was a very special event and made me so happy to capture the spirit of it with all. CJ and Brenda are wonderful, but I know you already know that! Lovely story…And great photos too. Muy lindo tu comentario, yo como jugador me emocioné leyéndolo. Los esperamos en Costa Rica el próximo año. Un abrazo.